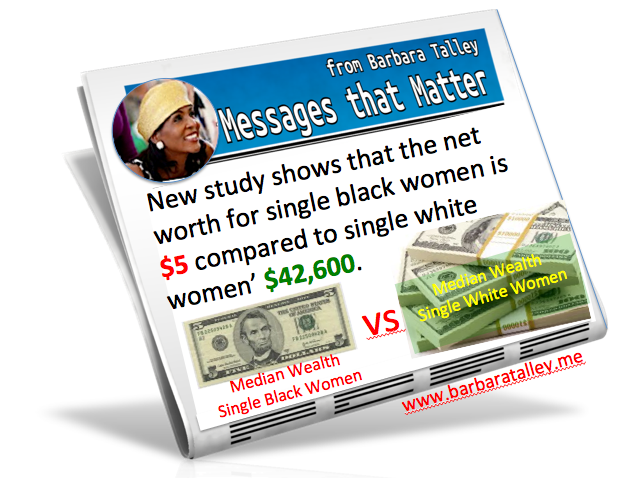 Net Worth of Single Black Women $5 Compared to White Women $42,600! Imagine not being able to take off a sick day, a mental health day to care for loved ones, or even a day to repair a major appliance WITHOUT GOING INTO DEBT! A new study released this week by a leading economic research group highlighted some startling statistics. Single black women between the ages of 39 and 46 had a median wealth net worth of only $5.00. Yes you heard me right, only $5.00!! Five dollars, Just enough to buy a $5 footlong. #SMH. At the same time single white women of the same age had a net worth of $42,600 (which is still only 61 percent of their single white male counterparts). Poverty at any age is a problem, but imagine being in poverty in the prime of your life. How does that bode for one’s future? Put simply, “If people are struggling to survive and have no wealth when they are most vibrant, healthy, and marketable, what’s going to happen to them when they age, have health problems, are laid off, have to take off to care for aging loved ones, or are discriminated against in the marketplace because of age? Consider that the average nursing home stay is over $83,000! What can you do? Did you read that carefully, “The current numbers are likely to be worse now than at the time of the study!” Worse than having a net worth of five dollars? The article challenges the myth that black women just spend more, explaining that the rising cost of living, lower wages, and being victims of subprime mortgages (paying up to 5x more) are major contributors. Add to high credit card debt which stems from using borrowed credit for present day survival and emergencies and you’ve got the crisis you see unfolding. “According to a study last February by the Institute on Assets and Social Policy, which tracked the same set of families over a twenty-five year period, the wealth gap between white and African-American households nearly tripled.”While the median wealth of white families nationally was $113,149 that year, it was only $5,677 for African-American families and $6,325 for Latino families.”White Americans own homes at a rate 28.4% higher than African-Americans. While white households lost 12% of their wealth during the recession, Latino households lost a staggering 67%.